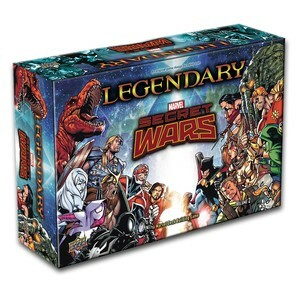 Continue to play through the Secret Wars storyline with Legendary®: A Marvel Deck Building Game: Secret Wars Volume 2. Players can work with and against other players to defeat the various Battleworlds while laying waste to planet Earth. The game features playable characters from the Illuminati, Cabal and favorites from alternate universes including Beast, Capt Britain, Spider Gwen, Ruby Summers, Dr. Punisher, The Solder Supreme and more! Legendary®: A Marvel Deck Building Game: Secret Wars Volume 2 has 16 new Heroes, 5 New Villain Groups, 4 New Masterminds, and 6 New Schemes! Build up your team to battle against the carious universes in Battleworld including X-Men '92, Mrs. Deadpool and the Howling Commandos, Deadpools Secret Secret Wars, and the Masters of Kung Fu. For the first time ever - Players can now play as the MASTERMIND against the other players!